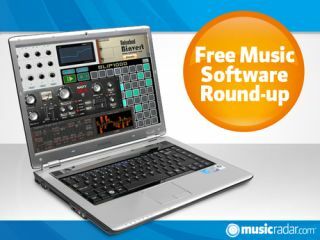 With the free music software round-up having taken a week off, there's been a little extra time for developers to deliver new plug-ins for us to tell you about. And deliver they have: an instrument, step sequencer and effects have all been released in our absence. If you make a lot of bass-heavy music and find that the different bass sounds end up cancelling each other out in your mixes, Binvert might be able to help. It works by splitting the signal into two bands and adding a phase invert for both, allowing you to invert the polarity of the two bands independently. Touchable step sequencer apps are all over the iPad, but this one is for Windows touchscreen PCs. You can create mono or polyphonic sequences of up to eight steps and the MIDI output means that you can use any synth as the sound source. You can download Blip1000 for free, though the developer suggests that you make a donation if you like it. This feisty organ is designed for anyone who wants to play heavily distorted riffs, chords and solos. Using a sound generation method known as wave draw synthesis (you draw the waveform) rather than the usual drawbars, it promises to be an organ that really cuts through. We mentioned that NastyDLA was on its way in our last round-up, and now it's here. It's a chorus/echo effect that's said to introduce authentic signal patch colouration, and also boasts tape delay style feedback and saturation. Given its name, it probably won't surprise you to learn that AQ1 is an EQ unit - a parametric one that promises to be low on CPU usage. There's a graphical display, and separate controls enable you to adjust the input and output levels independently.